Now there are a lot of radio stations and websites giving out tickets to concerts and well, we wanted to be different. So after talking to Eli Gerstner about how to make this contest different we came up with a plan. 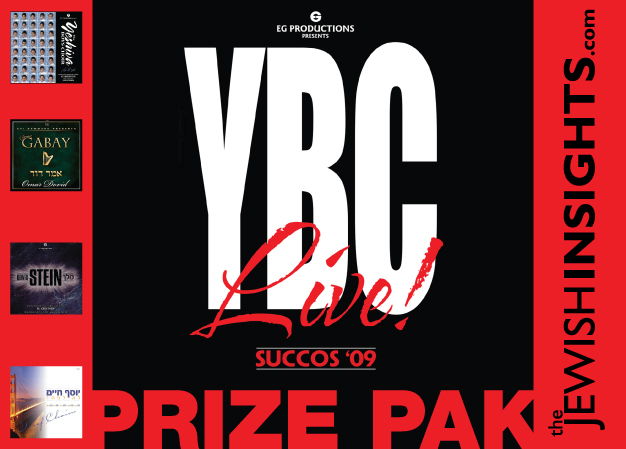 Not only will the winner of this contest win 2 VIP tickets to YBC Live! Succos ’09 but the winner will also receive a copy of all the performers latest cd’s signed by the artist themselves (YBC-YBC4 Shmoy Shel Melech, Dovid Gabay-Omar Dovid, Dovid Stein- Melech, Yosef Chaim-Lo Lefached). Not only that, but the winner will get a chance to go backstage during the concert to take photos with all the stars of the evening. TO enter the contest just either comment on this post or send a email to contests@thejewishinsights.com and list your 3 favorite songs that you want to see performed that night by which artists!